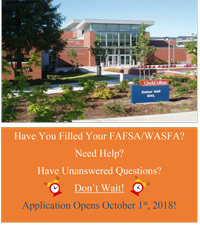 The Financial Aid Open Lab will provide the community with computer and printer access along with Financial Aid experts to assist students and their family through the FAFSA/WASFA process. Investments other than the home in which you live. College Goal Washington is a free program that helps students and families complete the Free Application for Federal Student Aid (FAFSA) or Washington Application for State Financial Aid (WASFA), the forms required to apply for financial assistance for attending college. The event is open to all students and families, no matter where a student plans to go to school. Whether a student chooses a four-year college, community college, vocational or technical school, College Goal Washington can help make education more affordable. Family financial information is a key part of completing the form, so students and parents are encouraged to attend together. If you need accommodation due to a disability in order to fully participate in this event, should contact Clark College's Disability Support Services Office at (360) 992-2314 or (360) 991-0901 (VP) or visit PUB 013, 2 weeks before the event. This event is sponsored by the Clark College Financial Aid Office.